A survey of elderly villagers in rural parts of China has revealed some of the monumental healthcare problems the country faces. Simply put, China is on track to have almost half a billion elderly people by 2050 and most of them will have chronic diseases but no treatment. The research carried out in 4400 households in rural areas of nine provinces found that a staggering 58% of elderly people are illiterate and many of them have been 'left behind' by children who have moved to towns or cities in search of work. For almost 70% of elderly people their annual income was below 5000 yuan ($810). And worryingly, they had high rates of chronic diseases: 18% had diagnosed hypertension, 3% had diabetes and 6% had asthma. However, these figures are likely to be underestimates because very few elderly people are getting health checks - only 3% had any kind of health preventive check in the past few weeks. Only 2% of patients had their blood pressure checked. Not surprising then that substantial proportions of those people with chronic diseases are not receiving any kind of treatment - 25% of people with hypertension and a third of those with diabetes were untreated, the study found. Published in the journal International Health, the findings show that China has huge numbers of vulnerable people with high health needs who are missing out on basic preventive care and treatment, says the author of the study, Dr Dai Baozhen of the Department of Health Policy and Management at Jiangsu University. Dr Dai says one of the main reasons for this sorry state of affairs is the lack of funding for preventive health in rural China. Most rural residents are covered by the New Cooperative Medical Insurance Scheme, which provides modest reimbursement for inpatient treatment for acute illness. However, the New Cooperative Medical Insurance Scheme does not cover much outpatient treatment and does not reimburse village clinics for preventive health checks such as measurement of blood pressure or diabetes checks. Even if it did, the scheme also fails to cover the basic 'disease management' approaches needed to curb chronic diseases. 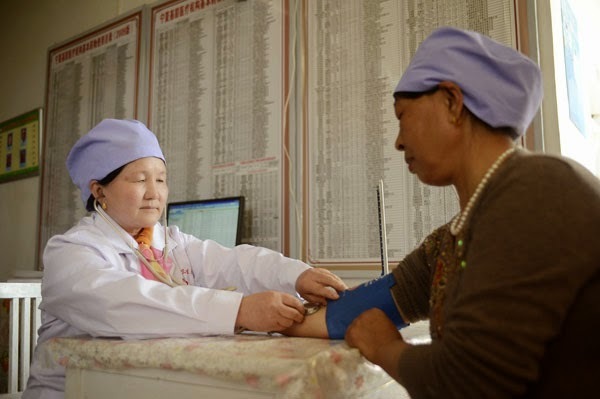 What this means in practice is that many people in rural China have chronic diseases such as hypertension and diabetes that are easily detected and which can be prevented and treated by simple and widely-available therapies. However, most elderly people miss out on the basic preventive and disease management approaches and so their chronic diseases are allowed to progress unchecked until patients develop later stages of disease that are more debilitating and more difficult (and expensive) to treat. But as Dr Dai points out, there is no point in offering health checks if there is no capacity to provide follow up with early treatment and preventive programs. "Until now, the New Cooperative Medical Insurance Scheme has not been structured to provide payment for prevention, promotion services and disease management for chronic conditions, and no health intervention (e.g. health education and promotion) is provided for groups at high risk of developing chronic conditions," he writes. Dr Dai concludes that with adequate funding, the New Cooperative Medical Insurance Scheme could provide early identification and management of chronic conditions and thus help prevent a huge burden of disease in some of China's most vulnerable and deprived people.